Emil Johnson Family. 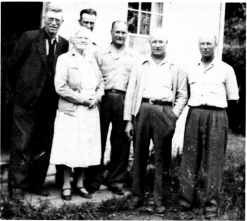 Left to Right: Emil, Hilma, Donald, Melvin, Irvin and Oliver. Johnson and moved to Alberta with their two children. Billy was born February 4, 1944 and Marion was born November 19, 1946. They stayed in Calgary for two months with Ruth's parents Dr. and Mrs. Wm. Cassidy. Then they moved to Acme and worked for Acme Locker & Trading. Billy and Marion spent one year of school at Acme. Then they purchased a store at Carbon, Alberta. It was closed so they made it into a variety store and operated it for fifteen years selling it in 1975. Since that time we are retired and live in Carbon. Billy attended the University of Manitoba getting his B.A. at Brandon and later his B.L.S. from the University of B.C. He is travelling ex­ tensively. At present, he is in Mexico with his wife Lorraine and three children, Jay, Shelly and Melissa. Marion spent one year going to school at Red Deer and then to Hollingshead Business college in Calgary. She has two boys, Douglas and Jeffry. She works for the Alberta Petroleum Marketing Commission and lives in Calgary. John August and his wife, Augusta Alma, left Stockholm, Sweden for Canada in 1903. They settled in Scandinavia and applied for a patent on S.W. 20-18-17W in April 1904 and received title on March 12, 1909. A two-storey house was built by John August on the homestead. They raised six sons and four daughters, all except the eldest, Roy, were born there. In 1928 the family moved into Erickson, rented the livery stable from Gustav Bengston, and lived in the home near there for several years. They purchased a house beside the doctor's office where the family remained. them several teams of horses, and a good number of cattle, including several milk cows. One of the sons drove "livery" for Doctor Rutledge, always on call and out on the winter roads on many a cold and stormy night. Travellers and farmers from the surrounding districts would shelter and feed their teams in the stable. The depression was at its worst and many would not have money to pay for the shelter, but none were turned away. One man from Scandinavia always paid in vegetables, and another, Grandpa Gronback from Danvers, paid in fresh frozen fish. Mother Augusta must have appreciated this as she most times fed seventeen or more people daily. A nephew, Hilge Mikkleson, arrived in Erickson from Prince Albert, Sask., in 1932, searching for work, and stayed with his aunt and uncle until 1938. John August built many of the bridges for the roads that were built in and around Scandinavia. He also worked on the railroad from Minnedosa to Eriksdale, later becoming foreman. In the winter of 1939-40, he took their teams and three sons went with him to cut wood in Riding Mountain National park. The wood was to be hauled out by truck and sold in Brandon. While at camp in the Park in the winter of 1940, they received word that a friend had passed away. John August wanted to go to Erickson for the funeral. The temperature that day was 50 degrees below zero. Son George had his car there and it froze up outside the Park Gate. John insisted on walking. The journey was too hard, he took ill, never fully recovered, and passed away that June. Augusta had the good fortune of having the family around her and with their support, she remained in her own home until she passed away in November, 1959. John and Augusta raised a very "home" oriented family. Music was a great enjoyment at home. With sadness, they have experienced the death of Roy, Ferdinand, George, Mabel, Lillian and Aulga. Alvin, the oldest, is married and living in Erickson, Gregor resides in Erickson, Bill married and makes his home here also. Signe, the second oldest, remarried in 1972 and lives with her husband, Roy Yates, in Burnaby, British Columbia. Ludwig was born in 1870, and Silla on February 27, 1871, in Bornholm, Denmark. Sil/a came to Philadelphia, U.S.A., in 1892. On May 2, 1898, Ludwig and Silla were married and in September, 1901, they came to the Scandinavia area. Ludwig applied for a homestead on N.E. 14-18-17W on February 5, 1903, and received his patent on May 31, 1910. They farmed there until retiring to Erickson in 1941. Ludwig served on the Council with Peter Christopherson.